This tranquil Aitutaki accommodation is an adults only retreat ideal for romantic getaways, honeymoons and the like. 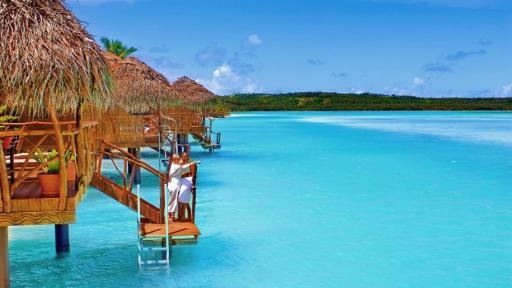 As the name suggests Aitutaki Escape allows guests to totally detach from the real world. From the spacious, beachfront villas to the stunning lagoon vistas guests are assured a peaceful, refreshing and magical Cook Islands holiday. Set in a stunning secluded islet right on the edge of Aitutaki Lagoon, Aitutaki Lagoon Private Island Resort presents breathtaking views of the lagoon and the surrounding beach and gardens. The resort offers the Cook Island's only overwater bungalows and Aitutaki's only spa, so everything you could possibly need while on holiday in the Cook Islands is never far from your accommodation. Set on 17 acres of tropical coconut gardens and fronting onto a stunning white sandy beachfront that looks onto Aitutaki Lagoon, facing west this amazing Cook Islands accommodation offers the perfect vantage point for stunning sunsets over the ocean. Just 40 minutes flying time from Rarotonga it is well worth the short flight for a luxurious, friendly and personalised stay on your Cook Islands holiday. Enjoy being surrounded by coconut trees on a stunning white sandy beach in the Cook Islands. Paradise Cove Lodges offers all this just steps from the door of your Bungalow. Just minutes from the airport in Aitutaki and you can be in your own little piece of paradise. Spend time lazing on the sand or swimming in the ocean, in the afternoon relax on your balcony while watching the sunset. Couples, families and groups will feel right at home at this Cook Islands Accommodation. This beautiful Cook Islands resort is located in tropical gardens overlooking the stunning Aitutaki Lagoon. Relax on the private magical beach and enjoy the stunning sunsets while enjoying an island cocktail from the beachfront bar and restaurant or your bungalow's veranda. Tamuna Beach offers bungalows with a choice of location, overlooking the garden, lagoon or absolute beachfront. 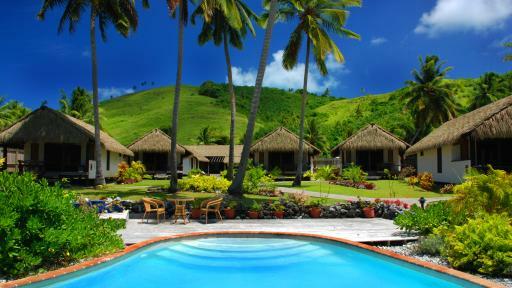 Enjoy a warm Polynesian welcome from this small but elegant resort for your ideal Cook Islands escape.